Why is It So Difficult to Form a Movement to Impeach Obama? | Stop Obama Now!! Why is It So Difficult to Form a Movement to Impeach Obama? 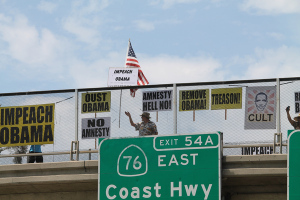 The biggest problem with developing a potent movement to impeach Obama is that non-profit patriot organizations are prohibited by law from being primarily about politics. A lot of members of these groups would like to help out with an impeachment effort, but I think they are loyal to their group and take their cue from their leadership, who are probably advised by their accountants and tax attorneys to not get involved in political activities that could be construed as partisan, such as a campaign to impeach and remove Obama could be construed. It might be enough for these groups to say, they can’t endorse an impeachment effort, because they are limited by the tax law, but as an organization they are not against it. That is, their members have to participate in such partisan activities as individuals, not as representatives of their 501(c) non-profit organization.